…its fleece was white as snow, yeah!! Hey folls! As promised, I’m keeping things light though the holidays, this time with another landscape shot. For this one, I’m channeling a little Buddy Guy rocking the blues with Mary had a little Lamb! I have to admit I’m really lovin’ this little break from my URBEX work. Hope you all dig it as well! Dave Wilson – Ooo – nice exposure control on this one. Please tell us you got it right in the camera and didn’t just boost the exposure a stop or two in Lightroom afterwards? 🙂 BTW, this makes me feel rather homesick. You don’t see too much snow or too many sheep in Texas. Jesse Pafundi – Fantastic image Jacque. Really loving your break from Urbex to see your style in different areas. Justin – I saw the tweet, and now had a chance to read the content. Great image! Big BG fan here. The guy doesn’t age. He is amazing. Chris Wray – Wonderful shot! I’m really diggin’ your landscape pics. What’s with the green paint on the sheep bottoms? Is it a form of marking? Guess branding is out with all that wool! Jacques – Hey guys! Truth be told, I could have done this with one exposure, but I would have had to use off camera flash to get the sheep exposed correctly. In this shot, I used 5 brackets, though that was overkill given the fact that the dynamic range was not very high with the overcast sky. 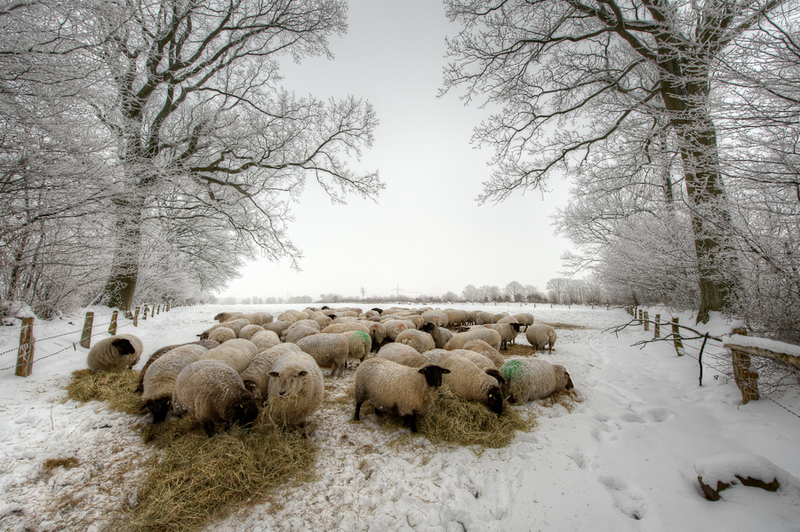 I could also have done this with 2 exposures: one at +1 to expose for the snow, and the other at +2 to expose for the sheep. Really glad you all are liking the landscape work, because I think I’m going to do more of that, mixed in with my regular URBEX fare. Regarding the green paint, the shepherd told me that he marks all the males with a different color so when he puts them in one of his fields to mate with the females, he knows which males mated with which group of females. Heath O’Fee – This is great, Jacques! Love the contrast between the snow and the grass/hay those cute little lambs are munching on! Bob Lussier – WOW! This is stunning! A wonderful diversion from Urbex! Looking forward to seeing what you do in 2011! Jacques – Hey Heath: Speaking of cute lambs, the farmer said there were several born just the night before. If we’d had more time, I might have tried to get over there with my kids to ooh and ahh at them! Dave: Thanks, man! It sure is nice to mix it up a bit, and I’m sure having fun doing that. I had a wonderful Christmas, by the way, and hope you did as well. Bob: As always, thank you! Always great to see you here, on your site and on twitter. We need to catch up soon, my man!